Influitive API access Contact Influitive Support to see if you have the API enabled in your package. 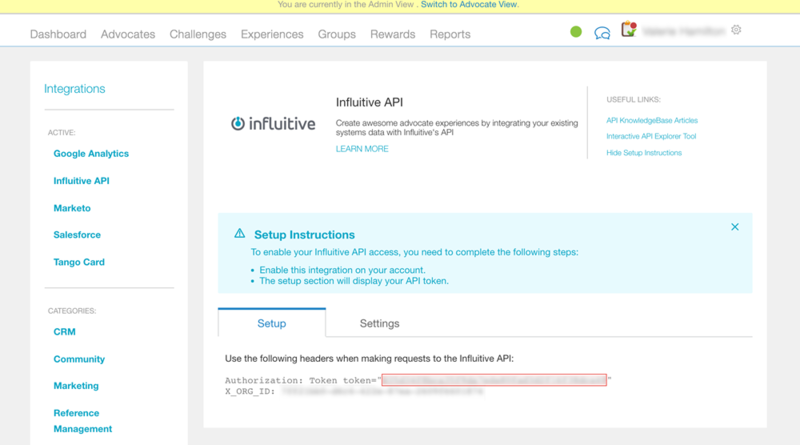 Find your API Token in Influitive. Choose Influitive from the list of data source connectors in Klipfolio. Browse through the Influitive API Documentation and decide what data you'd like to see on your Klip. Either complete the sample query in Klipfolio and get started with some data, or after finding some interesting endpoints and parameters in the API documentation, edit the query to make it your own. Let's find your API token in your Influitive account. You'll need it to use it to authenticate in Klipfolio. Note: If you can't find your API Token, make sure you have access to the Influitive API. Be sure to contact Influitive Support to confirm that you have access. Log into your Influitive account. Select Integrations (make sure you have access to this page). Copy your token (just the numbers and letters) and save it on your clipboard. To get started, go to the Connector Gallery page in Klipfolio and select Influitive. Once you clicked the Influitive button, you should now be in the New Data Source page for Influitive. Tip: API documentation is your friend! To discover what Influitive data is available to you, browse through the Influitive API Documentation and use it as a guide when customizing your query. Every service is different, so API documentation is your friend! As you browse endpoints in the Influitive API documentation, notice how GET requests are more appropriate data sources for building Klips than POST requests. That's because POST requests are meant to push data into your Influitive account, rather than get data out of the account. Now, back in Klipfolio, you should be on the New Data Source page for Influitive. The first thing you need to do is either (Option 1) complete the sample query and get started with some data, or (Option 2) after finding some interesting endpoints and parameters in the Influitive API Documentation, edit the query to make it your own. And again, remember to replace <yourHubName> with whatever your Influitive hub is called! Now in the Query Parameters section, you should keep all the information that is already pre-filled for you. You'll just need to make one change, which is to replace <yourAPIKey> with your token. You found your API Token in your Influitive account as a prerequisite step. Now that you have that Token handy, erase <yourAPIKey> and paste in your Influitive API Token. Now that you've entered all the key information, you can click Submit. If you are happy with the data returned, click Continue. Now you can use your Influitive data to build a useful data visualization for your team.